I only ate at "Ape with Pipe" once, and once was more than enough. Though the design was stylish and the music was funky, the meal tasted of burnt garlic, but the chef disagreed and assured me that the garlic was merely browned... With the ashen taste of culinary failure in my mouth I left that unholy restaurant and never set foot in it again. 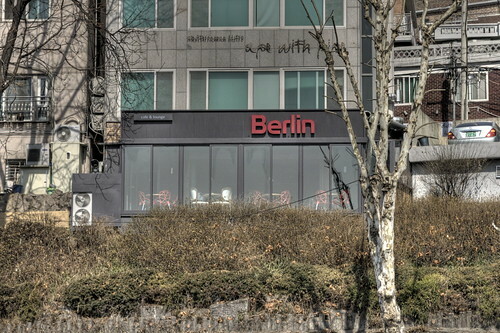 2009 and "Ape with Pipe" has gone the way of the dinosaurs, in its stead we have the third establishment from the Buddha's Belly team: Berlin Cafe & Lounge. Keeping the cool atmosphere of the previous restaurant, they have added that dark Buddha's Belly touch and have created a great looking venue. The lunch menu is simple, offering a choice of Thai style stuffed omelette (12,000 won), Thai style spicy pasta (10,000 won), red curried chicken salad (12,000 won), mussels mouclade (12,000 won) and fish and chips with wasabi mayo (14,000 won). 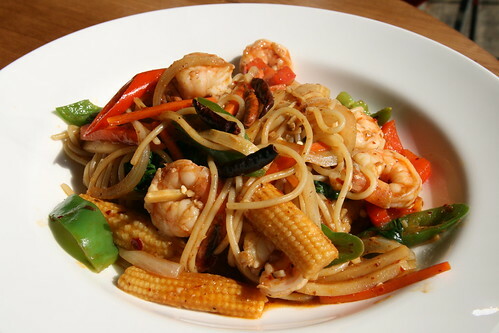 I went for the Thai style spicy pasta with optional prawns for a total of 14,000 won (plus tax). The food arrived promptly and looked incredible. There was a worrying amount of fresh and dried chillies, but the menu had specified that it was "spicy". They weren't joking! 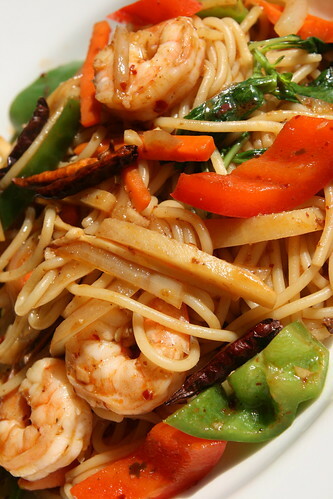 This dish is for the bravest of the brave, those who can handle their heat and are not afraid to burn their mouths. I wimped out and picked off the more fearsome looking 고추, but even with those gone, the spice remained and I spent most of the meal with a runny nose and a craving for dairy. That said, the chillies did not overpower the other flavours of the dish and the spaghetti was packed through with crunchy vegetables. The optional prawns were cooked to perfection and were plentiful. 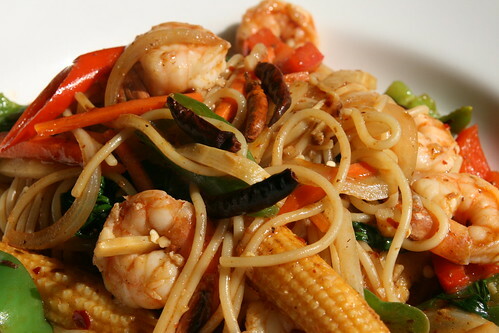 Hopefully the other dishes on the menu might be a little less scary, but if you're looking for a great dish that'll blow your head off and leave you wanting more, then Berlin's Thai style spicy pasta may well do the job. By the end of the meal my plate was clean and the taste of burnt garlic was nowhere to be found. Very spicy, but very delicious. 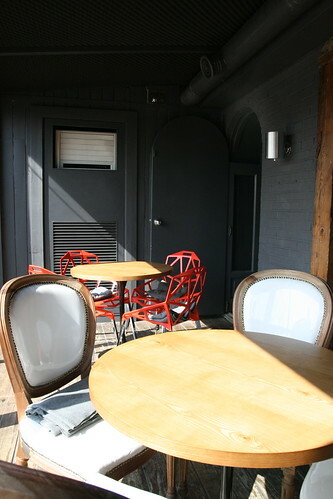 This fiery cafe has risen from the ashes of a mediocre ape and has been reborn into something wonderful. 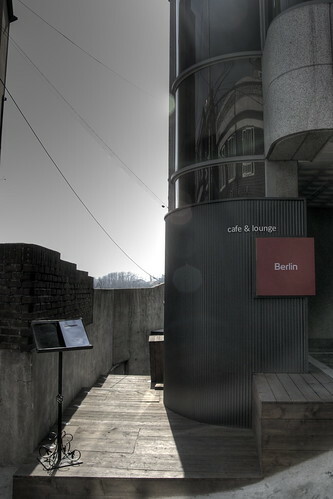 Berlin Cafe & Lounge is located on the hill above Noksapyeong station and can be accessed from the steep road up the hill opposite McDonalds. 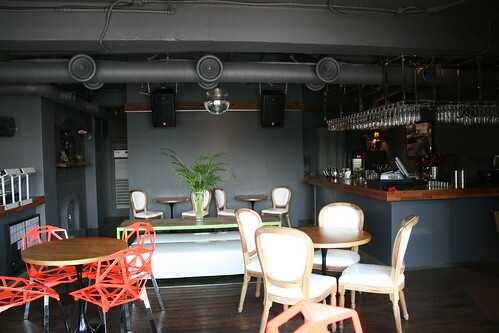 Buddha's Belly's website doesn't have any details on Berlin at the moment, but you can call them on 02 749 0903.